2018 promises to spoil the most savvy gamers: studios are preparing to release the continuation of series like Far Cry 5, Metro: Exodus, The Crew, Total war: Three kingdoms and other promising new games from well-known gaming studios like Anthem. It’s true that before new games are released, not everyone will manage to save up for powerful gaming computers that can deal with demanding software. However, this is no longer a barrier for gamers. Cloud-based gaming is becoming more and more popular. This technology allows a game to be run in the cloud from any computer, even the weakest one. The cloud-based gaming market is growing by more than 30% a year. Mac owners are actively driving this industry forward. The number of Mac owners worldwide is becoming bigger every day. In 2017, Apple became the fourth largest computer manufacturer in the world, selling almost 20 million devices. In terms of growth, the company has almost caught up with the market leader HP—7.3% against 8.3%. What’s more, only these two manufacturers showed positive growth. In 2017, the number of Mac users topped 100 million people. That is one out of every twenty gamers in the world—2 billion people. Why does growth among Mac owners influence cloud-based gaming? Imagine that you’ve been waiting six months for Apple’s presentation. You eagerly looked over the new Mac. You stood in line all night to be one of the first ones to get it. You got home and happily turned on the device. But once the first wave of enchantment had passed, you realized that the new Mac is great except for just one thing—you can’t run your favorite games on it. The majority of game manufacturers don’t even specify macOS in the minimum requirements while others, like the maker of World of Warships, refuse to help users who run a game on a Mac. Out of the 10 most popular games on Steam in January 2018, only four were available to Mac owners. GTA 5 and Counter-Strike were not among these games. So, what options does a Mac user have when it comes to gaming? Go to games specially produced for Macs. This isn’t the best option for those who are used to more: it’s like making a vow of celibacy. Embrace nostalgia. It’s not likely that a love for Full Throttle will last if that’s the only thing you can play and have no access to new products. Install Windows on Mac. You’ll enjoy new games… if you still have any strength left after doing this (or you won’t enjoy them, if the computer isn’t powerful enough). Go to a cloud-based gaming service site. It seems you’ve guessed what Mac users accustomed to convenience will choose. A few years ago, internet speed could be an obstacle but the connection speeds get better each year. In 2017, worldwide internet speed grew by 30% in comparison with the previous year and amounted to 40 Mbit/s for broadband internet. 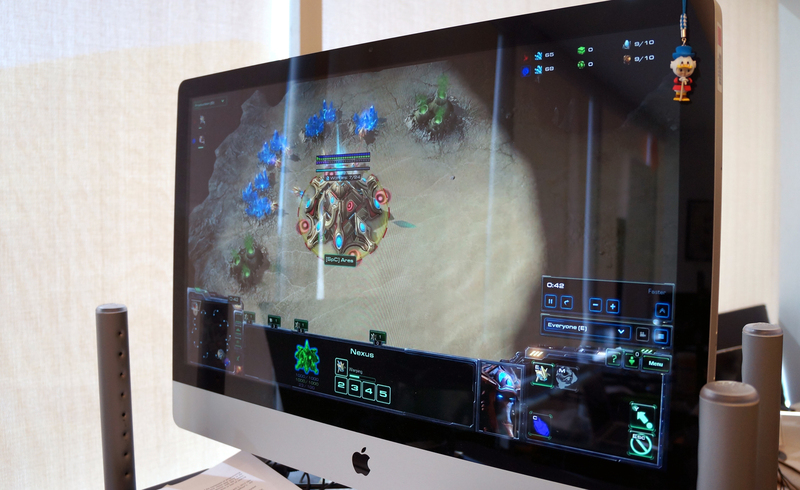 Therefore, the more Mac owners that appear, the brighter the prospects are for the cloud-based gaming market. And the reverse is true: the more actively the market develops, the more gamers won’t agonize over the choice between Windows or macOS before buying a new computer. This is amplified by the fact that a powerful gaming computer costs at least $1500 and this amount of money will allow playing hundreds of games for more than a year on cloud servers. The opportunity to play anywhere. You no longer need to slouch over a table alone in a dark room since you can take a laptop with a running cloud-based gaming service to the park or to visit friends. The ability to switch between devices. A game can start on a work iMac (don’t pretend, we know that you’re not working all the time) and finish on a laptop at home. The possibility to purchase an official game key on a cloud service site. Sometimes with better discounts than in the usual game stores. The chance to save money on games several times. On average, a subscription to cloud-based gaming is 3-4 times cheaper than buying gaming equipment for that same period. And the quicker the industry develops, the less one needs to spend on a subscription. No one can predict how the battle between Windows and macOS will end… or if it will end at all. But if gamers used to unwillingly be one of the main guarantees of PC survival, at last they have a choice now. And it’s possible that gamers, together with the creators of cloud services, will revolutionize the development of the entire computing world.